For its Spring opera this year, New Sussex Opera chose a real rarity indeed, Frederick Delius' rarely A Village Romeo and Juliet. The opera was directed by Susannah Waters, with designs by Anna Driftmier and lighting by Jai Morjaria. 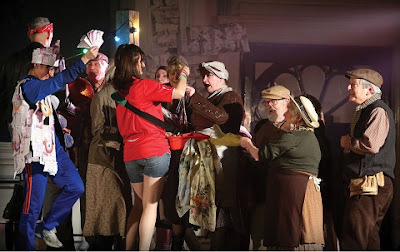 Kirsty Taylor-Stokes was Vrenchen and Luke Sinclair was Sali, with Ian Beadle as the Dark Fiddler, Robert Gildon as Manz and Geoffrey Moses as Marti. The conductor was Lee Reynolds with the Kantanti Ensemble in the pit. We saw the final performance of the tour, at the Devonshire Park Theatre, Eastbourne on 2 April 2017. Delius wrote the opera in 1900/01 to his own libretto (done in collaboration with his wife Jelka), and it was premiered, in German in Berlin in 1907, receiving its British premiere in 1910 when Sir Thomas Beecham conducted it at Covent Garden. Delius' operas have not been common in the UK in recent years, Fennimore and Gerda received a production at English National Opera in the 1990s, and whilst A Village Romeo and Juliet received a famous performance at Sadlers Wells in 1962, for the 150th anniversary of Delius birth there was just a concert performance of A Village Romeo and Juliet at the Southbank Centre in 2012, (see my review) and a projected Covent Garden production failed to materialise. Whilst the opera gives us two hours of mature Delius at his prime, the reasons for not staging it are myriad. The rather stilted libretto, Delius' rather cinematic requirements for the staging (six scene changes), the large number of small solo roles, the significant role played by the orchestra with numerous orchestral interludes which play an essential part in the drama, the rather undramatic nature of Delius' genius which makes it so fatally easy to think of the piece as one where nothing happens, and of course the fact that Delius wrote for a huge orchestra (triple woodwind) which means that the singers in the title roles (playing characters who are around 16) need to be positively Wagnerian. Lee Reynolds and Susannah Waters sought to remedy as much as this as possible in the production. For a start, Reynolds and Waters had revised the English libretto, making it less stilted (a process begun with the 1962 production), they also re-adjusted the piece structurally bringing forward the Dark Fiddler's long plot summarising solo to Scene 4, thus providing a bit more variety and drama. Reynolds also performed the work in a reduction for small orchestra (24 in total with single woodwind), a change which lost us the gorgeous sweep of Delius' work, but brought the piece to economic possibility, as well as greater intimacy and made the casting of young singers in the lead roles a possibility. New Sussex Opera is a group founded on an amateur chorus and A Village Romeo and Juliet does not give them much to do, so Reynolds and Waters used the chorus to remedy some of the other problems. Eleven smaller roles were taken by chorus members; Driftmier's very effective set was made of wooden elements which was constantly manipulated by the chorus, not only effecting scene changes but by their constant presence creating a sense of the community which puts so much pressure on Sali and Vreli's relationships. 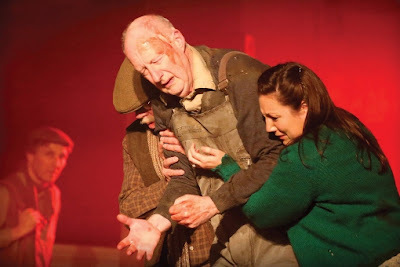 This was an opera centred on the concerns of a small town community, something which helped put the plot into context and providing the back-story which Delius omitted. I found the production highly atmospheric and enjoyed the deliberate lack of technical sophistication in the sets; the walls of the house doubled as a platform when laid down and had to be supported by chorus members when vertical. But one of my companions found it annoyingly problematic and another disliked the extensive use of smoke. But, as I have said, the way Waters make the chorus members a constant presence was a strong plus point in focusing the drama. Reynolds and the Kantanti Ensemble made a strong case for the music, and certainly made the orchestral reduction work. We lacked a certain amplitude in the strings, but got a focused intimacy and some nice solo lines. Unfortunately, the Devonshire Theatre lacks an effective pit so the orchestra was in front of the stage (the first two rows having been removed) which meant that the orchestral sound was a bit more present that desirable. In the first scene, though treble Alex Edwards gave a gallant performance as Young Sali, his lower register was often inaudible and as Nell Parry as Young Vrenchen was matching him for volume, she was not much better. For the adult singers, the vocal lines came over but with the balance favouring the orchestra, we heard very little of the text. Luke Sinclair and Kirsty Taylor-Stokes made a suitably ardent Sali and Vreli, if slightly stiff. Taylor-Stokes combined a spinto-ish cutting edge with an ability to spin Delius' endless line. She could not make it sound completely effortless, but brought a nice intensity to the part and created a sense of Vreli's doomed soulfulness. Sinclair is quite a find, a young tenor who combines a commandingly tall physique with an admirably secure tenor voice. His voice is also rather more robust than lyrical, and a brought a sense of vigour and action to Delius' vocal line. Lacking was the ideal fluid flexibility of line, instead Sinclair gave us strong personality, commitment and a fine sense of energy and stamina (it is a pretty big sing). 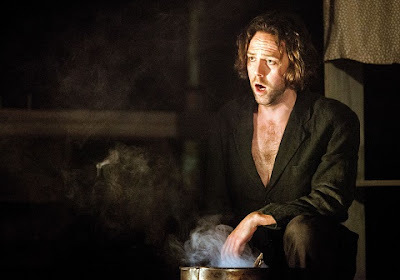 Ian Beadle made a rather wistful Dark Fiddler, emphasising the character's vagabond nature and the seductive idea of otherness, rather than mining the sense of mythic strangeness which can also apply to the character. The fact that we could barely hear his words was very much a disadvantage her, but thankfully Beadle was an expressively physical performer. 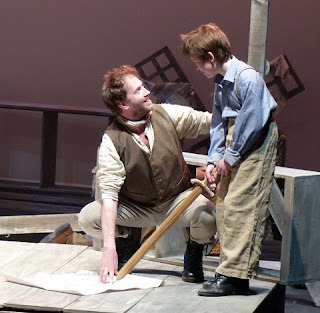 Robert Gildon and Geoffrey Moses made strong work of the small roles of the children's father, who develop their dispute over as strip of land into something all consuming. 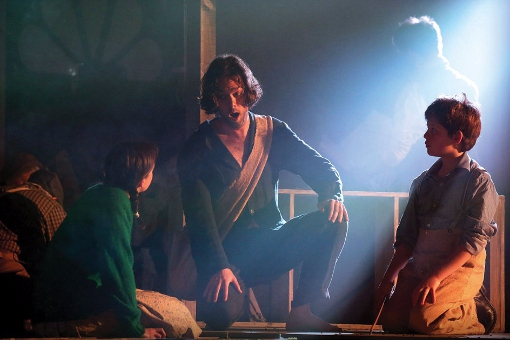 The smaller roles were all characterfully sung and the chorus entered with a will into Waters' concept and really created a sense of community on stage. I have to admit that I am still not convinced of the stageworthiness of Delius's genius. The operatic drama seems to be a little too bound up in the orchestral nature of the writing, as if Delius took certain elements from Wagner's music dramas (he was a great Wagner admirer) without understanding how Wagner created some strongly dramatic stageworthy contexts too. 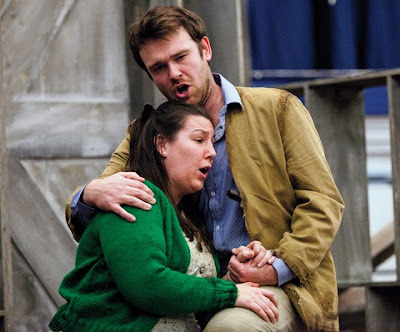 But I have great admiration for New Sussex Opera's dramatic achievements with the work, and the way Lee Reynolds drew some fine textures from his players and strong performances from his soloists. And I am extremely glad that the company braved the opera's reputation to give us a chance to experience it on stage.